You sound awesome. Maybe you can skip a seniority number by paying for it. Not a chance in hell. Minimum 500 hours PIC on 777 when testing is what you need. You can join on 737, and wait for upgrade according to the Seniority list. Thats how it works. Last edited by MD80767 Driver; 23rd Jul 2018 at 05:54. I'm a B777 captain. European based, but soon to move to the US. Would you mind helping me with some of the following questions. I'd prefer not to take what the agency says on face value. How long does the training take, and is it punitive. How difficult is housing to come by, or expensive is an hotel. When on trips, can you leave baggage in the hotel. I've done the contract thing before, and learned how the little things make a difference - what food is available, and do they allow you to bring food into the country. Tax. 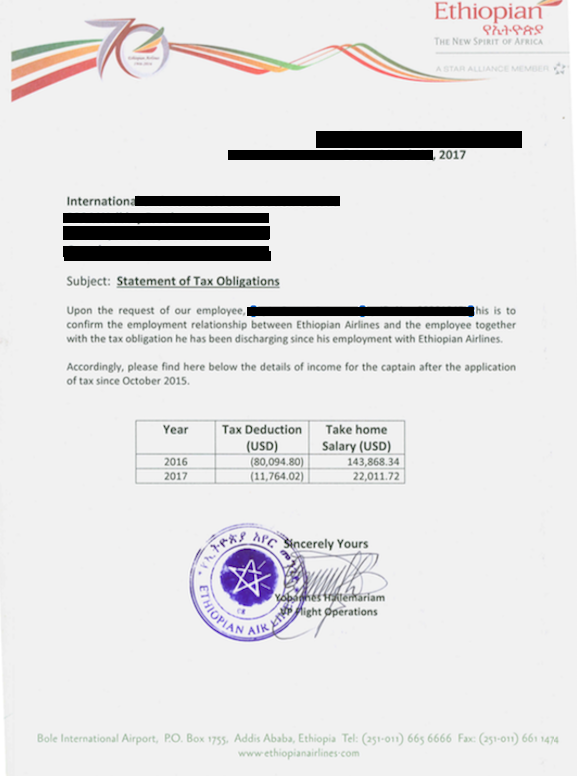 My understanding is that a tax certificate is only useful when there is a treaty between Ethiopia and your country of residence. Otherwise, it becomes a hindrance, as you become liable for tax in your home country for the 'gross' amount. From my reading, Ethiopia has double taxation treaties with only 10 other countries. Is the economy, upgradable to business hit and miss, or is there usually a seat in business. Sorry to come in late to this thread, but could someone clarify for me how ET crews its European operations? Do the crew have a day rest in MAD and then depart the evening of the day they arrived, or do they overnight 1-2 nights in MAD? It's reported here that ET will serve ADD-MAD-DUB from winter onwards and I'm trying to understand what the crewing pattern will be. i know. I was laying on the sarcasm pretty thick. Recently a Captain was docked 5 days pay for not accepting a flight with one hours notice. Docking of pay is not even in the contract. They make it up as they go. Much more to it than just that. But yes he was docked. Ive been docked $350 for not being contactable after legal rest. Mutual blame. Its a "pager" airline, once you are legal turn your phone on and await the scheduling changes. Once you have had your legal rest be prepared for any and all possible flights. One of the employees at Parc had told me that the $15000 is actually withheld from your pay over the first year and then not paid to you until 3 years is up even if you're rated and current on the 787,seems unfair seeing there is very little training cost involved and just a way of retaining you for at least 3 years, has anyone had actual experience of this or is it just particular to Parc? Apparently to get your ECAA ATPL you need to complete the full SIM course (5 sims and a check (Maybe 4 sims, can't remember), So even if you are current on the fleet you are applying for you will have to do the full SIM training in order to qualify for your ECAA ATPL. However if you resign and return at another date in the future for some reason, as some have done, then you only have to do much less training (something like Training SIM, Check SIM and a Line-Check) since you already have your ECAA ATP from before. Below Tax Letter will certainly open a can of worms. Its 777 Captain. 2016 is a full year 12 months. Im speculating it roughly equates to basic salary plus Housing and Perdiem (9000+1250+1250x 12 months). It definitely doesn't include OT and the biannual $5400.00. However Im speculating and really don't know how the amount was derived exactly. Im just showing what the CO provides and stamps. Last edited by 777747; 26th Oct 2018 at 20:48. Are there any 777/787 ladies and gents from the UK that can shed some light on the tax situation. Are you able to take the salary back to the UK tax free due to the dual taxation agreement? Any help is greatly appreciated. See tax letter attached to this thread.. Thats all you'll get. no official Government Issue tax letter or tax return, just the ET stamped letter. Will your country accept this is the Big Q! Do you guys get ZED tickets for use with other airlines? Cause Ethiopian doesn't fly to my home country. I am considering to apply as a DEC B777. Last edited by MD80767 Driver; 27th Nov 2018 at 09:52. Last edited by FMC OVERHEAT; 27th Nov 2018 at 18:13. Anyone have a rough time frame for getting on line on the 737? Are we talking like 30-40 days,assuming minimum sectors? And would I then need to do the 20 days on before going on the regular roster? I'm trying to gauge how long I would be in country after starting,before getting home. As we are coming into the Christmas now I am trying to juggle a couple of things. I am due in Addis next week. I figured I'd probs be there till mid January. I know...how long is a piece of string right? Another biggie for me...if I wanted to get my missus down for new years, is there any staff travel for family or is that after completing training or a certain time? I do not have much experience with ZED travel or ID90 as I worked for a LCC for 10 years so it wasn't really in the vocabulary. With regards the accommodation situation, as I understand it, they will cover the hotel for 30 days or until completing training? If they are not paying salary until you are line checked, I may have to pay for accommodation before seeing any wages? It's a little vague. Having said that,I'm looking forward to the trip and I appreciate any help y'all can offer. Feel free to PM me! Want poor infracstruture, no WiFi, no electricity? I do not get it, plenty of jobs in Europe and you planning on dark Africa? Talk to the Pilot Union, Ethiopian is corrupted, they violate every rule of ECAA, overwork their own local crews, disrespect rest times, and flying time limitations, they pretend they like to see pilot reports, nothing changes, you are caving into a dark hole and no protection whatsoever; Most recently the U.S Embassy posted some issues with Tifus and contaminated water, apart from checks on arrival about Ebola Virus spreading fast as Ethiopian cover several Congolese destinations. B737 flying is the most perilous, new copilots, new Captains, difficult network, lost of feedback on hard landings, and tail strikes, training is weak, management non existent, they are busy covering audits from IOSA, CAAC and others like GCAA in Dubai and Israel, about to decertify them for poor compliance of rules and procedures. Hard evidence on all these allegations for those who dare to discredit comment. And to answer your question, no days off during induction, you are looking at six weeks of training and then 20 days of continuos flying before you taste the 10 days off you are probably looking for. regarding ID-ZED you have 6 round trip tickets per year. On new contract they removed the 2 business class tickets. So now only economy ones. they also decreased salaries by 10% by removing the 6 months bonus (which now comes after 3 years) and removed the other bonus that was paid yearly after the third year of service.